A Scott Schedule is a precise columnar presentation of the issues to be decided and the position of each party on the issues. Prepared before the start of the hearing, everyone, including the Arbitrator and witnesses, is better equipped to conduct a fair and efficient process. A Scott Schedule has been touted as an instrument of efficiency in litigation and in one case, as expediting the resolution of quantum (damages) issues in arbitrations. In this article, I will attempt to define a Scott Schedule, its origin, as well as its use in other areas and argue for its increased use in arbitrations, especially where multiple issues are involved. Most counsel and arbitrators are familiar with a Redfern Schedule. The Redfern Schedule is a columnar presentation of a request for disclosure, usually for documents, and contains the submissions of the requesting party, the position of the responding party and a fourth column for use by the Arbitrator for a decision on the requirement for disclosure. A Scott Schedule is also a columnar presentation of multiple issues to be decided by the Arbitrator. It has been described as a “form of particulars usually ordered in actions where a party’s case is made up of a substantial number of claims. A Scott Schedule is named after its originator, His Honour George Scott, Official Referee of the United Kingdom High Court of Justice, 1920-1933. When used in a Court, it is intended to particularize each individual claim so that it may be identified with certainty by the Court, the parties and their witnesses, in terms of the amount asserted by each party and the submissions of each party in relation to each individual item. It can produce areas of agreement, as to the description of the item or issue, the amount in dispute and can narrow the issue on any item. As far as I have been able to ascertain, the Scott Schedule is or has been in use in family law, both to isolate what allegations are being made in respect to parenting obligations and access, as well as other financial proceedings. A Scott Schedule also has been the subject of a practice direction of the Ontario Superior Court. The Practice Direction applying to all civil proceedings in that region mandates that a Pre-Trial Judge hearing a first pre-trial conference shall order a Scott Schedule and any responding schedule be prepared and delivered prior to the next appearance date in the event settlement is not achieved at the first pre-trial conference. In commercial arbitrations, often times the pleadings embodying the claim, response, counter-claim, and reply are voluminous and are not, nor are they necessarily required to be confined to allegations of fact. In many cases, pleadings set forth the evidence a party relies on and even contain argument. Like any dispute, as the parties proceed, often times the approach, and in fact the issues, become clearer and some parts of the pleadings are neglected, if not abandoned without any formality. Given that in an arbitration hearing, there is usually an opening statement, sometimes pre-hearing submissions in writing, fact witnesses statements exchanged in advance, expert reports and expert witness statements exchanged in advance, documents, sometimes even oral questioning in advance, a Scott Schedule prepared prior to the arbitration hearing may serve to not only isolate issues, but also can be helpful in sequencing the evidence on each issue at the hearing. This concept applies not only to lay witnesses but to expert witnesses. An example of a Scott Schedule is set forth below in terms of a format. Many tout a Scott Schedule as a useful tool in building or construction claims. Note that in the format, there is space for the Arbitrator to make comments and the decision on the issue. While that may be useful in some cases, a better use of the Scott Schedule in advance of the hearing is to get the basis for, and a proper description of, the claim and the amount claimed in respect of each issue and the position of the parties on that issue. It is not enough for a respondent to simply say the claim is not admitted or the claim is denied. The Scott Schedule is designed to elicit reasons for a response. Also, many headings can be devised in any format. For example, in some construction claims, there is a column for what the claimant states is the scope of remedial work necessary and a place for the respondent to state its position on the alleged scope of work, as well as a response to the allegation of alleged unsatisfactory or faulty workmanship. There can also be separate columns with respect to remedial costs if both parties agree that a remedy or remedial work is needed but the real dispute involves cost. Ideally, the parties agree on format and each can insert their own content. 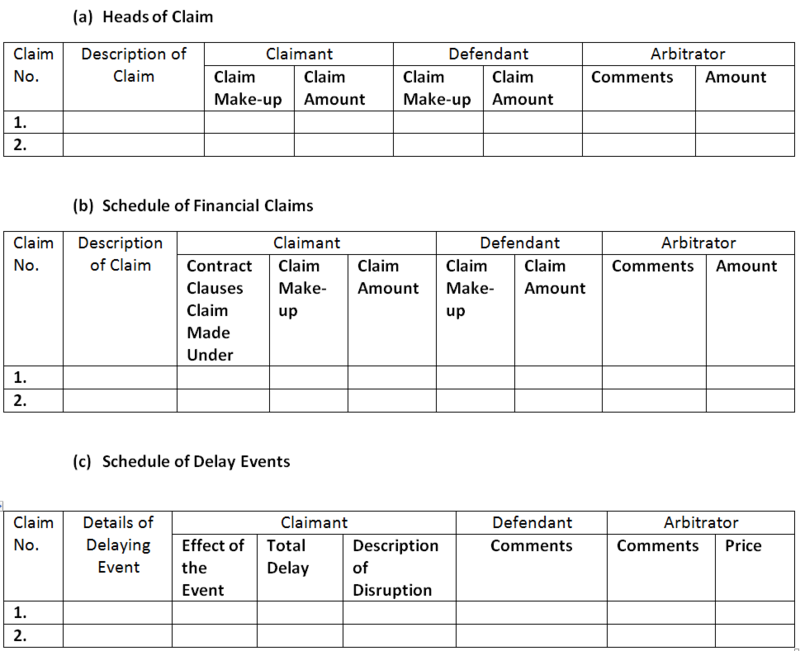 Thereafter, the schedule will have, in columnar form, the claimants’ position on all relevant issues, as well as a statement of those issues and a description of the evidence supporting each position. The respondent then replies with admissions or agreement or a denial, but in all cases, states the reasons for the position. From the point of view of an Arbitrator, the Scott Schedule prepared by the parties can be presented to the Arbitrator prior to the arbitration hearing, at a pre-arbitration meeting. Any disputes as to format or content can be decided by the Arbitrator at that meeting and the arbitration hearing can go forward on the basis of the Scott Schedule. Of course, the object is to reduce time and thus the cost involved in the arbitration hearing and decision phases. With intense focus by all parties on the preparation of a Scott Schedule, some of the issues may be resolved and others narrowed. As stated by Scott Gray, use of the Scott Schedule to expedite the resolution of quantum issues is “particularly well suited” and its use has been recommended in the “Final Report on Construction Industry Arbitrations” commissioned by the ICC Commission on International Arbitration”. The use of a Scott Schedule is recommended in complex arbitrations involving multiple issues. It injects clarity immediately before the hearing of an arbitration, rather than leaving issues to be defined solely by pleadings, some parts of which have been forgotten or at least not mentioned at the hearing. It helps focus all parties and witnesses prior to the hearing and provides a road map to conclusion, not only for the parties, but also for the Arbitrator. Ideally, the parties consent to the format and identification of the issues. Presentation by Scott D. Gray at a Conference on “International Arbitration: Managing Risk in High Growth – High Risk Markets”, A Conference for In-house Counsel and Executives Involved in International Arbitration, September 10, 2008. District Court of Western Australia Circular to Practitioners, August 3, 2007. Practice Direction concerning civil proceedings in Central East Region, January 1, 2017. Scott Gray, International Arbitration Conference, September 10, 2008.